The phone is ringing shall I answer? My shoes are good luck. Just call me Mr Ed. My girl friend has a pony tail. Isn't it silly talking to a horse? 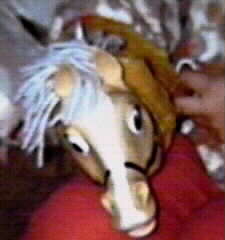 I'm a horse Of course... "whinny"
I'll be the horse you be the buggy. Who has a horse face...."snort"
:::Scroll+Choose Mr Ed Puppet Phrase click button on media player ::: Come on lets talk Isn't it Silly talking to a horse I'll be the horse you be the buggy Just call me Mister Ed Oh Horse Feathers I'm a horse of course My girl friend has pony tail My shoes are good luck The phone is ringing shall I answerWho has a horse face? 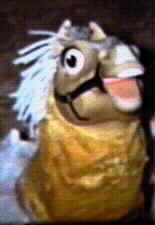 I just happen to have one of those cool Mr. Ed puppets by Mattel too. 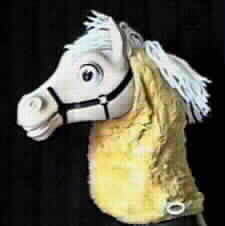 The difference is that mine was given to me by the person who was the VOICE of Mr. Ed. Awwww Wilburrrr! He was a family friend, really my Dad's friend. He showed up at our house one X-mas day in his huge royal blue Cadillac, with the trunk and back seat loaded with puppets. He told me c'mon Tad lets go find some poor kids around town and give 'em a surprise they won't forget. He didn't have to ask me twice.... That's the kind of guy he was. 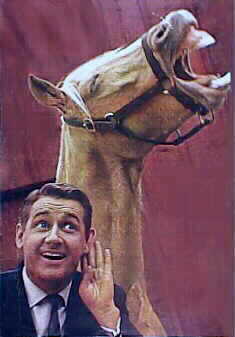 "Rocky" Lane was the voice of Mr. Ed. My Dad T.W. "Wally" Dunn is a famous thoroughbred horse trainer (now 86 years young) He knew Rocky from the track where all the movie stars used to hang out during the early days. It was the in place to be. 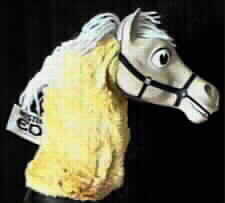 I was just a ten year old kid when Mr. Ed made his debut, but had known Rocky before that. I believe he regarded it as a bit of a hoot, because he had made some serious dramas and was in some of the old westerns. I still run into him on some of the cable channels now and then, and there's that famous voice! He used to drop by our house in Arcadia from time to time, where he and Dad would have a few drinks and play the piano and start to sing! Rocky died of lung cancer.